Info "That UFO up there is you! Avoid the attack from below!" UFO Assist is a microgame in the Sci-Fi folder in WarioWare, Inc.: Mega Microgame$!. The player controls a UFO at the top of the screen with the , and has to dodge the shots from the ship below. On level two, the ship shoots faster, and on level three, the ship has better accuracy, making it hard to dodge. 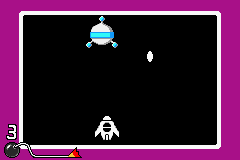 This microgame is the reverse of the Introduction microgame, Repellion, in that the player controls the spaceship and tries to shoot the UFO. French Sauvez l'O.V.N.I! Save the U.F.O! This page was last edited on September 27, 2018, at 13:38.